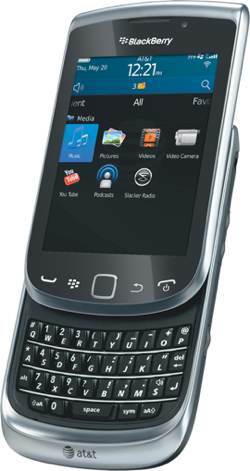 Powered by the next-generation BlackBerry OS 7, the BlackBerry Torch 9810 smartphone runs on AT&T's 4G network, which provides broadband speeds up to 4x faster than AT&T's already fast mobile broadband network. The Torch 9810 is faster and more fluid than its predecessor with high performance hardware features that help deliver an enhanced multimedia experience. A powerful 1.2 GHz processor provides smoother multitasking and navigation, fast downloads, and crisp HD 720p video recording via the Torch 9810's 5-megapixel camera. And the integrated Liquid Graphics technology combines a dedicated graphics processor with the main processor for a highly responsive touch interface with incredibly fast and smooth graphics. Packed full of the latest mobile technologies, the Torch 9810 includes an augmented reality feature that uses the built-in compass (magnetometer) to display over 150 million points of interest, BBM contacts, and more. And BlackBerry's universal search has been amped up in BlackBerry 7 OS. With speech-to-text translation, you can now look for files, e-mail, contacts and music--and even search the web--all without typing a thing. With BlackBerry, on-the-go productivity is the name of the game. You'll get access to the world-class BlackBerry push messaging service with access to up to 10 supported business and personal e-mail accounts, plus BlackBerry Enterprise Server support for corporate e-mail installations. The DataViz Docs To Go Premium suite is pre-loaded for editing Microsoft Word, Excel and PowerPoint files from anywhere, and you can access BlackBerry App World to download more productivity apps (as well as games and more). The new BlackBerry browser offers incredibly fast page load times, better web-based gaming, HTML5 video support, and seamless scrolling and zooming. 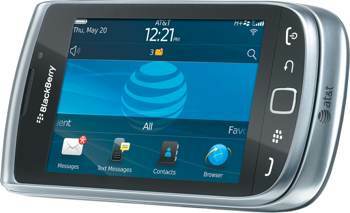 This GPS-enabled phone can also access the AT&T Navigator service for turn-by-turn directions (in addition to using the built-in BlackBerry Maps app). Other features include an 8 GB internal memory, expansion via microSD memory cards (up to 32 GB in size), Bluetooth for hands-free devices and stereo music streaming, 3.5mm stereo headset jack, and up to 6.5 hours of talk time. 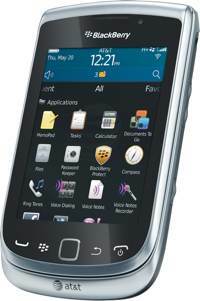 The BlackBerry Torch 9810 weighs 5.68 ounces and measures 4.37 x 2.44 x 0.57 inches. Its 1270 mAh lithium-ion battery is rated at up to 6.5 hours of talk time, and up to 300 hours (12.8 days) of standby time. It runs on the 850/900/1800/1900 MHz GSM/GPRS/EDGE frequencies as well as AT&T's dual-band 4G network (850/1900 MHz; HSPA+/HSDPA/UMTS). AT&T Navigator: This premium GPS navigation application includes audible turn-by-turn directions, real-time traffic updates and re-routing options, and 3D moving maps (additional charges applicable). AT&T Navigator offers several other features to make your commute more enjoyable and reliable, including mobile access to Yellowpages.com. You'll be able to find the closes ATM, restaurant, gas station, Wi-Fi hotspot and more with over 10 million business listings. AT&T FamilyMap: Locate any phone indoors or outdoors on the AT&T Network. FamilyMap provides peace of mind by being able to conveniently locate a family member from your wireless phone or PC and know that your family's information is secure and private. Want to verify that your child arrives home from school each day? Set up a Schedule Check to automatically get location information sent to you via text message or email. Ultra-fast 4G connectivity via AT&T's HSPA+ network (with enhanced backhaul). See more about AT&T's 4G service below). Where 4G isn't available, your phone will connect with AT&T's 3G network. Data tethering for connecting a PC to your phone's 3G/4G cellular connection. DataPro monthly plan also provides unlimited access to more than 26,000 AT&T Wi-Fi Hot Spots. Bluetooth connectivity (version 2.1) includes profiles for communication headset, hands-free car kits, and A2DP audio streaming. BlackBerry Messenger (BBM) 6 allows you to send and receive messages in seconds as well as see when your contacts are typing. Swap pictures, videos, voice notes, and more (files up to 6 MB in size). You can even text non-BBM friends from the BBM screen. BlackBerry App World features a broad and growing catalog of third-party mobile applications developed specifically for BlackBerry smartphones. Categories include travel, productivity, entertainment, games, social networking and sharing, news and weather, and more. BlackBerry Balance separates personal content from corporate content, giving the freedom and flexibility to use the smartphone for personal e-mail, Facebook, Twitter, multimedia, games and other apps, while satisfying the need for corporate data to be highly secure and manageable. BlackBerry Maps lets you view maps and receive directions on your BlackBerry smartphone. Zoom or pan through interactive maps when looking for locations or directions, get easy-to-follow turn-by-turn directions, and send maps via e-mail or text messages. Compatible with BlackBerry Enterprise Server for advanced security and IT administration features within IBM Lotus Domino, Microsoft Exchange and Novell GroupWise environments. 5-megapixel auto-focus camera with 4x digital zoom, flash, face detection, image stabilization, geo-tagging, zero shutter lag, and multiple scene modes. Documents to Go Premium mobile document suite lets you create and edit Microsoft Word, Excel, and PowerPoint docs as well as view PDF files. Premium edition supports password protected files, charting pictures, and spell checking for Word docs.